Every year, my husband and I take turns choosing our style of Christmas tree decor. So what does this have to do with soap? Everything -- if you're me! 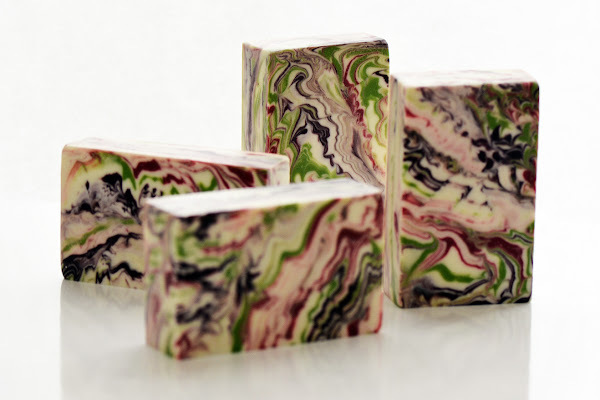 This month's soap challenge is called the Cosmic Wave. It's one of the more difficult ones we've attempted, because you have to get the batter thickness, color balance and placement exactly right. And you have to have some luck on your side, as once you mix the colors in the pot and pour, they need to just flow out as they will, without one wiggling them about. This works just fine as a study in Brownian motion, but is nerve wracking if you're as control-oriented as I am! In my first attempt, my batter was too thin, and each successive pour just sunk to the bottom in a muddy mess. On my second try, the batter was too thick, and it ended up looking like a blobby finger painting. Since I used only 5% of the batter for each color, I super-saturated them at 1.5 t/ppo. The remaining 85% was colored with titanium dioxide. Which just means altering the ratio to use less coconut and castor with more olive/canola/grapeseed than I normally do. The latter is one of a handful of decelerating fragrances I use only when I need to, as they all have a cloying and rotten-smelling note. Bleh, but they work! Next time, I'd do almost all of it as a quick in-the-pot swirl, and just add the cosmic wave technique on the tops. There's really no point to doing it elsewhere, as it won't show. D'oh! That way, I could also skip the decelerant and make a much bigger batch. Claudia, these are beautiful as always!!! 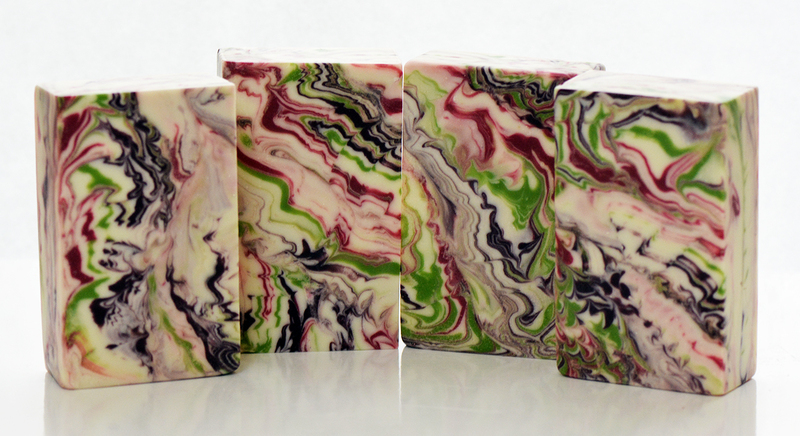 I did a half and half soap to use a brown discoloring soap on the bottom, and then the wave on the top. The cosmic wave seems to be an "ace up the sleeve" technique when you need it most! Looks fantastic, Claudia! I wouldn't change a thing!! I hadn't considered the idea of just doing the cosmic wave on top, but I'm sure it would work. I think it was good to do the technique throughout for the challenge just for the sake of practice (which I know I needed!). 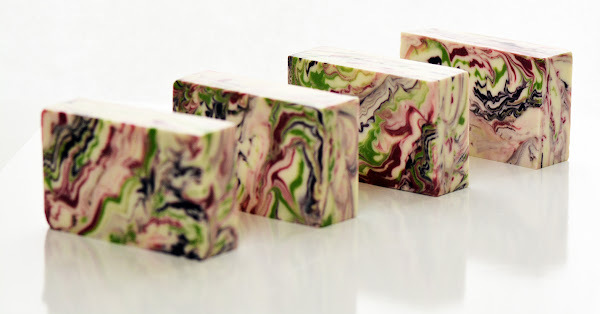 Sweet looking soap and beautiful color combination! That's a great idea to pour only on the top layer for sure. Nice colors and wave! Great idea to just do the top and Sara's idea for the discoloring FO on the bottom! I am always learning so much from everyone...now all I need to do is remember it!! Beautiful! The colors work very well together. It all came together so well. I am impressed!!! Gorgeous! Thanks for all the details. I will re-do a cosmic swirl with you suggestions! I love the colors. Great job. This was such a hard challenge, but you obviously rocked it. So gorgeous, as always, Claudia! I really love all the different color and wave variations between the individual pours. Well done! Your palette is lovely. I think your take on Christmas colors is imaginative yet cohesive. I also really like your tiny waves. So pretty! 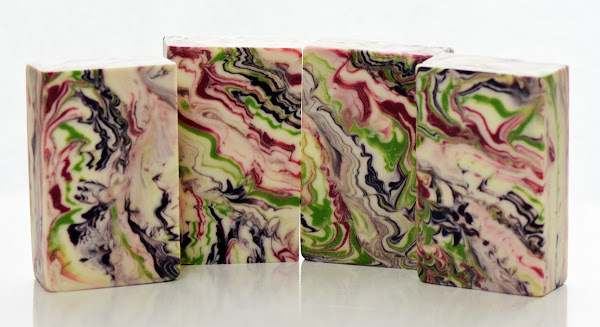 Great colors in your soap!..it turned you fantastic. Nice job! Claudia!you are a true artist and you never ever disappointed me. Hi, I'm Claudia. As a Silicon Valley engineer, designer and startup adviser, I've been creating software since the stone age. My more well-known projects are Google Docs (aka Writely, before Google acquired us), Quicken and Quickbooks. 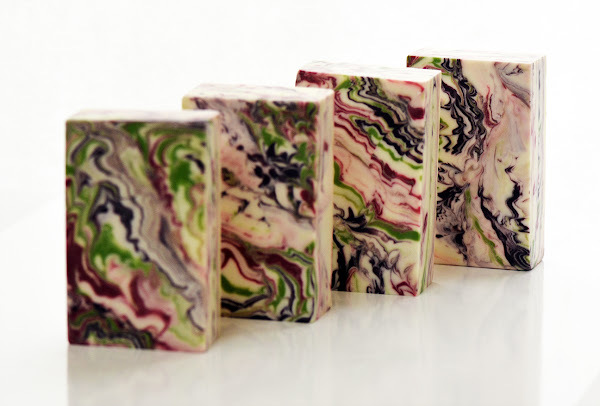 Oh, and I kinda like to make soap!